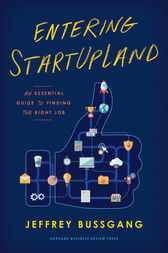 Many professionals aspire to work for startups. Executives from large companies view them as models to help them adapt to today's dynamic innovation economy, while freshly minted MBAs see magic in founding something new. Yes, startups look magical, but they can also be chaotic and inaccessible. Many books are written for those who aspire to be founders, but a company only has one or two of those. What's needed is something that deconstructs the typical startup organization for the thousands of employees who join a fledgling company and do the day-to-day work required to grow it into something of value. Jeffrey Bussgang is a venture capitalist, entrepreneur, and professor at Harvard Business School, where he teaches Launching Technology Ventures, a popular class for MBAs starting or joining startups. His firm, Flybridge Capital Partners, has over $600 million under management and has invested in more than 100 companies since its inception. He was previously a two-time entrepreneur (Upromise, Open Market), started his career with the Boston Consulting Group, and holds an MBA from HBS and a BA in computer science from Harvard College. His previous book, Mastering the VC Game, is an essential guide for entrepreneurs raising capital.